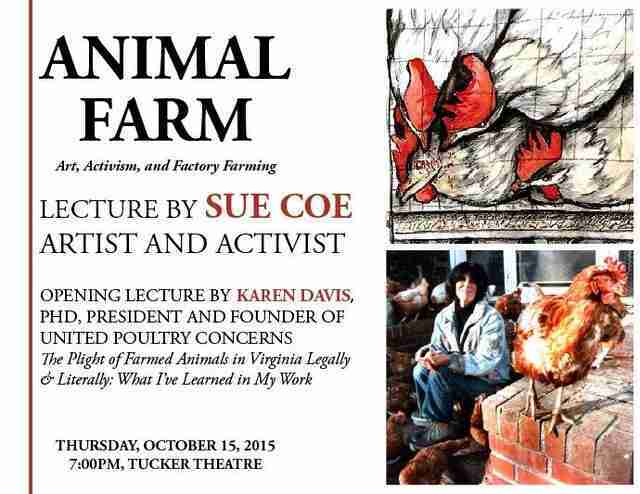 UPC President Karen Davis and Artist Sue Coe Tell Audience, "Go Vegan"
Speaking to an auditorium filled with students and faculty at The College of William & Mary, in Williamsburg, Virginia, on October 15, UPC president Karen Davis and renowned visual artist Sue Coe depicted the plight of farmed animals in Virginia and around the world in vivid PowerPoint presentations and impassioned lectures featuring a coalescence of art and activism. Asked by a student during Q & A if we thought there could be "humane animal products" as opposed to "factory-farm" products, we shouted NO! A student afterward said she'd been afraid, when that question was asked, that we'd cave in to the hokum of "humane" alternatives and was so relieved that we stood our ground for the animals and being vegan. The event was sponsored by the Committee on Sustainability and the Department of Art & Art History at The College of William & Mary. Delicious vegan food was prepared and served by Students for Animals, whose advisor, Alan Braddock, Associate Professor of Art History & American Studies, initiated the venue after visiting United Poultry Concerns and meeting our chickens with his students last May. We are grateful to Professor Braddock and to his inspired and inspiring students Meagan Phillips, Lindsay Garcia, Rachel Merriman-Goldring, Delaney Berman, and Ada Hao, for organizing this exciting evening for farmed animals, animal rights art and activism at William & Mary.